The topic of this thesis is the concept of the design and evaluation of a light weight wearable haptic interface, which is able to exert forces on its user's right hand and arm. The principles of the realization of a prototype wearable haptic interface are presented. It was investigated whether inherently limited mechanical properties of the device like mechanical stiffness impose deficits to the quality of the haptic interaction. The usability and acceptance of the device by its users is another main topic that is investigated. 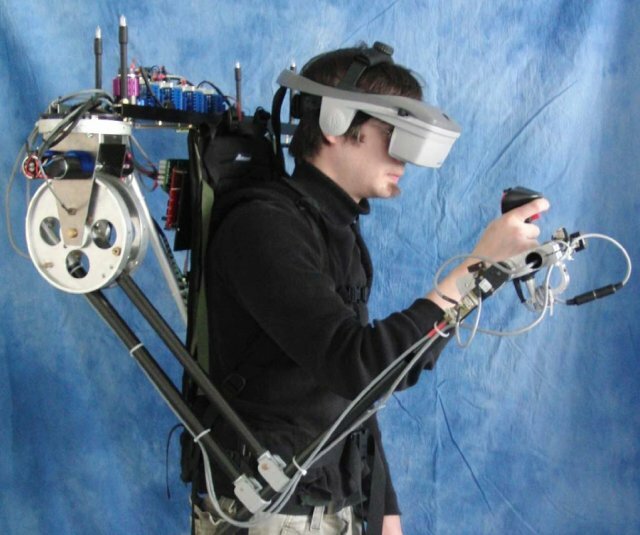 A virtual reality framework was developed in order to realize an immersive and multimodal virtual test environment for the investigation how a wearable haptic interface has to be properly designed and controlled. The framework provides the user with 3D visual, audio and haptic feedback. A method is explained how a haptic renderer has to be modified in order to realize haptic feedback in arbitrarily large and geometrically complex environments. As the user and sound sources are free to move in the environment common stereophonic audio feedback is not sufficient. Therefore a 3D soundfield synthesis system was developed, which enables the user to localize sound sources in the three dimensional virtual environment. The used methods are presented in this thesis and their performance are evaluated. The thesis includes an evaluation in terms of a statistical investigation of the usability, which was conducted with 18 participants. On the basis of the results of this study it is reasoned whether it is possible to compensate the limited stiffness of the device by means of different modalities. The impact of the deflection of forces on the user's body on the usability is another main topic that is investigated. A documentation of the virtual reality framework which was used for the presence questionnaire and the individual answers of the participants can be downloaded.